I probably should have read the book Loki by Mike Vasich first, before dabbling into this one, but I needed a short and easy read and this was exactly it. 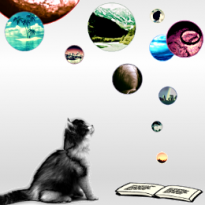 I expected to get nine thematically related but not closely-knit short stories. However, the nine stories in this book from some sort of a novella, retelling Norse and Christian mythology with some new twists. The stories range from humorous to grotesque, sometimes with a palpable Nordic feel, and at other times diverging from it quite a bit into the area of perhaps self-mocking. I am on the fence about how to feel about the part where Vasich stories overlaps Nordic and Christian tradition: on one hand, Vasich’s version is logical; but on the other hand, I simply dislike his idea. In Vasich’s version, Loki, pretending to be Jesus, convinces Judas to betray the real Jesus, and after Jesus’ death, he steals Jesus’ body and fakes resurrection. Obviously, as a Christian, I have a problem with this. However, I agree with the idea that Judas’ betrayal was a part of God’s plan and he was actually doing God’s will – without it, Jesus’ sacrifice and salvation wouldn’t be possible. Although I said the stories form a unit, some of the timeline is jumbled and inconsistent, which, as per author's note, was done on purpose, because he didn’t want to divert too far from the original tales while still giving them his own spin. Lastly, I couldn’t help but imagine the characters as the Marvel universe characters, so I had to put some effort into re-adjusting my visual idea of them. 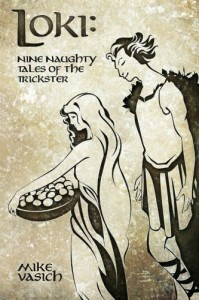 Overall, Loki: Nine Naughty Tales of the Trickster is an interesting spin on Norse mythology, in particularly Loki. RECOMMENDATION: Loki: Nine Naughty Tales of the Trickster might be a good book for those interested in Nordic mythology.